The 2009 EasyCare Hoof Boot Contestis well under way. Riders have already logged an impressive 2,673 miles. Our 2008 contest winner Terri Tinkhamand her horse Oliver Twist are currently in the lead with 360 miles. Natalie Herman and her horse Hoanna aren't too far behind in second place with 310 miles. Christoph Schork rounds off third place with 210 miles. Not bad considering the 2009 contest began at the end of December! Now is the time to enterin the 2009 contest and log some miles of your own. This years contest brings some new rules and prizes so be sure to check out the 2009 Hoof Boot Contest pagefor further details. We have a TRIVIA contest at our website www.easycareinc.com for the month of March, 2009. Go to our site and answer the question concerning our Fit Kits. Then, send your answers to our marketing department, and all correctly answered entries will be eligible for the drawing. The drawing will be held on April 2, 2009. The winner will be notified that day and posted in our newsletter. Hmmmmm, what will you buy with your $100.00 Gift Certificate if you win???? Last month our website winner was Betty Ingram of Manchester, Massachusetts. She won one FREE pair of new Easyboot Glove boots. Alright Betty!!!!!! In the 2008 EasyCare Hoof Boot Contest it's Terri Tinkham in the lead! 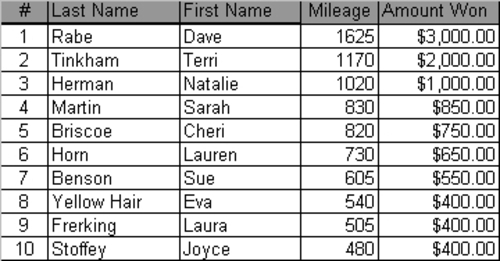 Terri and her horse, Oliver are currently in first place with 1520 miles. 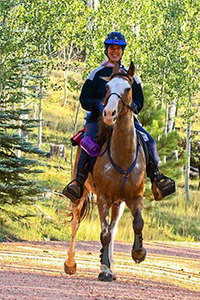 Trailing not far behind Terri is Natalie Herman with 1035 miles on her horses; Cheyenne and Hoanna! Way to go Terri and Natalie! For our 2009 Hoof Boot Contest the concept will be very similar to the 2008 contest but we are thinking of making the following changes. 1. Add an additional award for placing in each AERC region. 2. Bonus monthly payouts for each mile over 200. 3. Competitive Trail organizations will be added. 4. Bonus payouts for best condition awards. In addition EasyCare is looking to partner with 1-2 riders in each AERC region. We are looking for riders that plan to do 500+ yearly miles and have a good grasp of hoof boots and hoof boot fitting techniques. 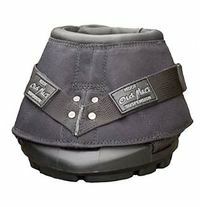 We have 4 new hoof boots that will hit the market in 2009 and the selected regional riders will help EasyCare introduce the new designs in their region. EasyCare will compensate the selected riders. If you are interested please click here. 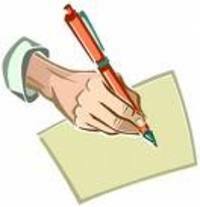 EasyCare is looking for people interested in being contributing authors to our newsletter and blogs! We are looking for hoof care practitioners or experienced boot users who would like to answer booting questions. If you are interested, please drop us an e-mail at marketing@easycareinc.com. 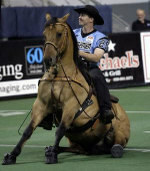 EasyCare's $10,000 Hoof Boot contest for 2008 is in full swing! We are half way through the ride season and the total milage is at 11, 183 miles. Terri Tinkham and her horse Oliver Twist are in the lead with 1,070 miles! Keep up the good work everyone! First place prize for this contest is $3,000.00, second place prize is $2,000.00 and the third place winner will receive $1,000.00. There are prizes for the contestants that come in 4th-10th also. If you would like to know more about EasyCare's Hoof Boot contest please click here. Now is the time to buy your horse some Old Mac G-2 or Old Mac Original boots. For every pair that you purchase on the EasyCare website, you will receive a FREE magnetic hoof pick when you use the Promo Code. Just insert OLDMAC at checkout in the promo code section, insert part number Hoofpick, the quantity and your order will be discounted by $7.95 for each pick that you are entitled to. There is still time to get some great horse boots and the FREE hoof pick. This sale is good until July 31st, so hurry and get your order placed. Win a Free EasyCare Hoof Bag! 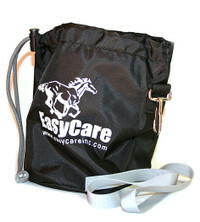 Would you like to win a FREE EasyCare hoof boot bag?????? Answer our contest question and submit for a chance to win. We will give away a total of 15 new EasyCare hoof bags in a drawing from all entries submitted with the correct boot name. Limited to one entry per email address and household. Entry deadline: April 15, 2008. Winners will be announced on May 1, 2008. 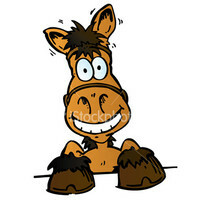 What EasyCare hoof boot is on the horse in our current national advertising? Our ad campaign runs in the following national magazines....Trail Rider, Trail Blazer, Horse and Rider, Horse Illustrated, Equus, Western Horseman, The Perfect Horse, Holistic Horse and Endurance News. Good Luck and Happy Riding!!!!! EasyCare and the Equine Sciences Academy are pleased to announce the recipients of the two $1000.00 EasyCare scholarships for the spring 2008 term. The winners are Laurie Joslin of Saanichton, BC and Cori Brennan of Sharon, SC. As the field of natural hoof care continues to grow, so will the demand for qualified professionals. EasyCare is excited to be able to assist those looking to make natural hoof care a career. We are currently working on expanding our new scholarship program to include additional programs and organizations that educate and train in the natural care of horse's hooves. If you would like more information about the Equine Sciences Academy or want information on the application requirements please click here. Congratulations Laurie and Cori from EasyCare! Win a Pair of Easyboot Epics! On the EasyCare website, we post testimonials of real success stories from our customers around the world who have used our hoofboots with fantastic results. If you have a story we would love to hear it! 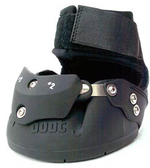 The best testimonial submitted each month will win a FREE pair of Easyboot Epics. You can click here to submit your story (be sure to include a picture). Why not let us know how happy EasyCare makes you and your horse and win a free pair of boots? If you have not already signed up to receive the EasyCare monthly newsletter via e-mail, you should do it now! 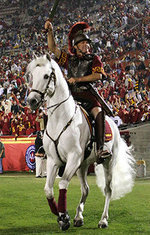 We have exciting new contests coming in 2008. 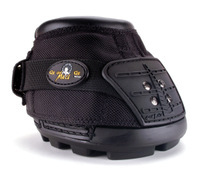 One upcoming contest is a trivia contest and the winner will win a pair of our new Easyboot Edge hoof boots! Click here to sign up for our newsletter so you don't miss out! Tucson, AZ December 12, 2007. Hoof boot manufacturing company EasyCare, Inc. today announced a new 30-day money back guarantee policy that will allow customers to receive their money back if they are not fully satisfied with any EasyCare, Inc. product. The new improved guarantee is one of the strongest in the industry, making EasyCare hoof boot products risk-free for new customers to try. By offering a "no questions asked" 30-day money back guarantee EasyCare gains a competitive advantage within the hoof boot industry. The new EasyCare money back guarantee takes effect January 1, 2008 and applies to all new orders. "Our goal is to gain consumer confidence by making our products completely risk free," explained Brian Mueller, Director of Sales for EasyCare. 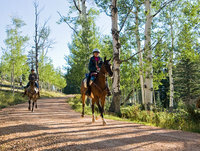 "Our products have been proven on thousands of different horses and over every type of terrain. We believe we are the best at what we do based on our years of experience, knowledge and customer results. EasyCare has always been committed to providing the best service in our industry. We are so sure you and your horse will love our products, we decided to upgrade our return policy. We know that once you try our products you will continue using them." We back all of our products with a money-back guarantee. If you are not completely satisfied with this product for any reason, EasyCare will gladly refund your purchase price (excluding shipping and handling) within 30 days of purchase. To qualify all products must be returned to place of purchase and have a dated receipt. Offer not valid for EasyCare bargain bin, factory seconds or custom boot purchases. EasyCare, Inc. has been a leader in the hoof boot industry for years, beginning with the invention of the Easyboot back in the early 70’s. Since then, the need for boots has grown tremendously as more and more horse owners see the healthy advantages of pulling shoes and switching to natural hoof care. EasyCare is excited about being part of this growing trend. For more information about hoof boots or natural hoof care please call EasyCare, Inc. at 1-800-447-8836, e-mail: admin@easycareinc.com or visit our website at www.easycareinc.com. 2008 Ride Season is Almost Here !!! As the 2007 ride season and contest comes to a close, check out our site for all of the interesting and informative updates from this year and previous results. Ride season is from Dec 1- Nov 30. Want to enter for 2008.....go direct to this link for the contest entry form http://www.easycareinc.com/_system/lib/Content/Home/Cool_Stuff/boot-contest08-entry-form-print.pdf and lots of information to get you going! Can You Guess the Correct Answer to Win? We have had so many of you folks out there wanting to participate in testing EasyCare's product - well here it is - your chance to join! Check out our link to Team Easyboot and be among the first to sign in!